Define arc length, rotation angle, radius of curvature and angular velocity. Calculate the angular velocity of a car wheel spin. In Chapter 2 Kinematics, we studied motion along a straight line and introduced such concepts as displacement, velocity, and acceleration. Chapter 3 Two-Dimensional Kinematics dealt with motion in two dimensions. Projectile motion is a special case of two-dimensional kinematics in which the object is projected into the air, while being subject to the gravitational force, and lands a distance away. In this chapter, we consider situations where the object does not land but moves in a curve. We begin the study of uniform circular motion by defining two angular quantities needed to describe rotational motion. Figure 1. 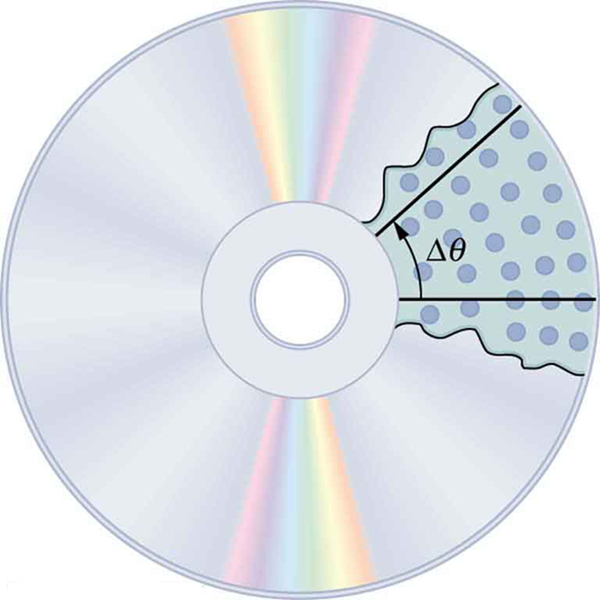 All points on a CD travel in circular arcs. The pits along a line from the center to the edge all move through the same angle Δθ in a time Δt. Figure 2. 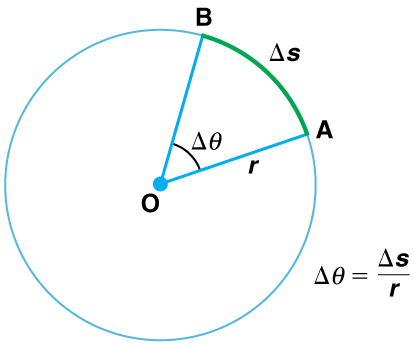 The radius of a circle is rotated through an angle Δθ. The arc length Δs is described on the circumference. 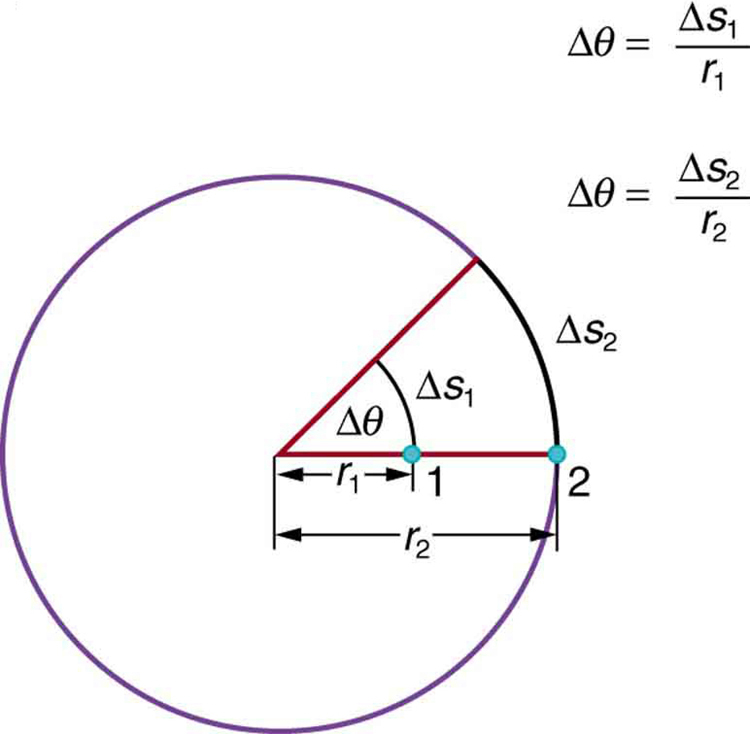 The arc length is the distance traveled along a circular path as shown in Figure 2 Note that is the radius of curvature of the circular path. A comparison of some useful angles expressed in both degrees and radians is shown in Table 1. Table 1. Comparison of Angular Units. Figure 3. Points 1 and 2 rotate through the same angle (Δθ), but point 2 moves through a greater arc length (Δs) because it is at a greater distance from the center of rotation (r). where an angular rotation takes place in a time The greater the rotation angle in a given amount of time, the greater the angular velocity. The units for angular velocity are radians per second (rad/s). The first relationship in states that the linear velocity is proportional to the distance from the center of rotation, thus, it is largest for a point on the rim (largest ), as you might expect. We can also call this linear speed of a point on the rim the tangential speed. The second relationship in can be illustrated by considering the tire of a moving car. Note that the speed of a point on the rim of the tire is the same as the speed of the car. See Figure 4. So the faster the car moves, the faster the tire spins—large means a large because Similarly, a larger-radius tire rotating at the same angular velocity ( ) will produce a greater linear speed ( ) for the car. Figure 4. 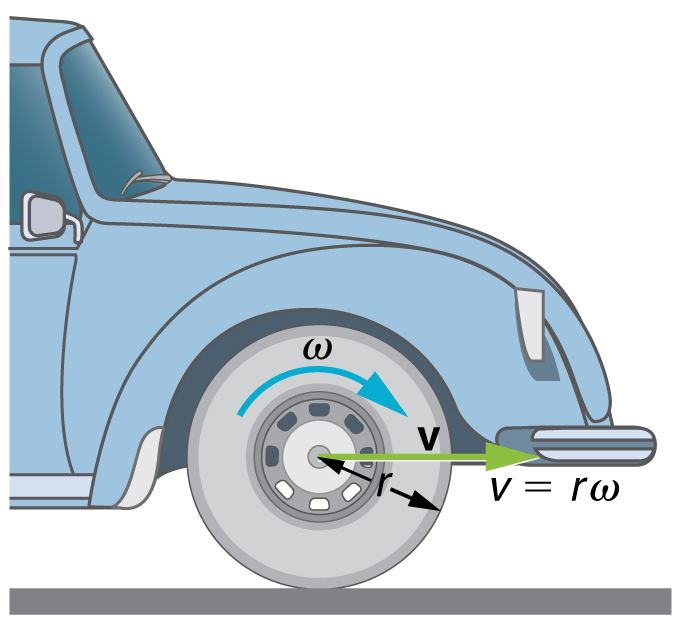 A car moving at a velocity v to the right has a tire rotating with an angular velocity ω. The speed of the tread of the tire relative to the axle is v, the same as if the car were jacked up. Thus the car moves forward at linear velocity v=rω, where r is the tire radius. A larger angular velocity for the tire means a greater velocity for the car. Example 1: How Fast Does a Car Tire Spin? Calculate the angular velocity of a 0.300 m radius car tire when the car travels at (about ). See Figure 4. Because the linear speed of the tire rim is the same as the speed of the car, we have The radius of the tire is given to be Knowing and we can use the second relationship in to calculate the angular velocity. Both and have directions (hence they are angular and linear velocities, respectively). Angular velocity has only two directions with respect to the axis of rotation—it is either clockwise or counterclockwise. Linear velocity is tangent to the path, as illustrated in Figure 5. Tie an object to the end of a string and swing it around in a horizontal circle above your head (swing at your wrist). Maintain uniform speed as the object swings and measure the angular velocity of the motion. What is the approximate speed of the object? Identify a point close to your hand and take appropriate measurements to calculate the linear speed at this point. Identify other circular motions and measure their angular velocities. Figure 5. 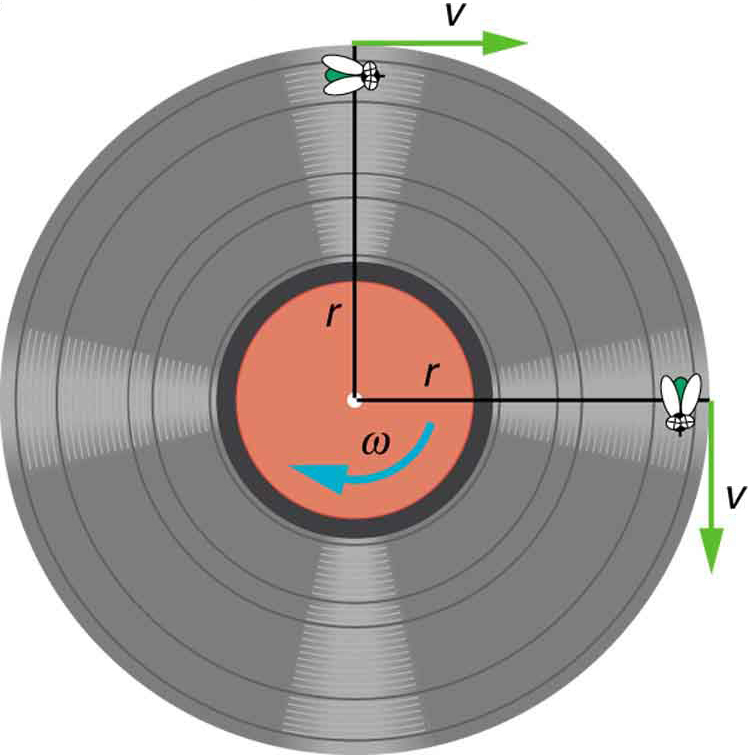 As an object moves in a circle, here a fly on the edge of an old-fashioned vinyl record, its instantaneous velocity is always tangent to the circle. The direction of the angular velocity is clockwise in this case. 1: There is an analogy between rotational and linear physical quantities. What rotational quantities are analogous to distance and velocity? 1: Semi-trailer trucks have an odometer on one hub of a trailer wheel. The hub is weighted so that it does not rotate, but it contains gears to count the number of wheel revolutions—it then calculates the distance traveled. If the wheel has a 1.15 m diameter and goes through 200,000 rotations, how many kilometers should the odometer read? 2: Microwave ovens rotate at a rate of about 6 rev/min. What is this in revolutions per second? What is the angular velocity in radians per second? 3: An automobile with 0.260 m radius tires travels 80,000 km before wearing them out. How many revolutions do the tires make, neglecting any backing up and any change in radius due to wear? 4: (a) What is the period of rotation of Earth in seconds? (b) What is the angular velocity of Earth? (c) Given that Earth has a radius of at its equator, what is the linear velocity at Earth’s surface? 5: A baseball pitcher brings his arm forward during a pitch, rotating the forearm about the elbow. If the velocity of the ball in the pitcher’s hand is 35.0 m/s and the ball is 0.300 m from the elbow joint, what is the angular velocity of the forearm? 6: In lacrosse, a ball is thrown from a net on the end of a stick by rotating the stick and forearm about the elbow. If the angular velocity of the ball about the elbow joint is 30.0 rad/s and the ball is 1.30 m from the elbow joint, what is the velocity of the ball? 7: A truck with 0.420-m-radius tires travels at 32.0 m/s. What is the angular velocity of the rotating tires in radians per second? What is this in rev/min? When kicking a football, the kicker rotates his leg about the hip joint. (a) If the velocity of the tip of the kicker’s shoe is 35.0 m/s and the hip joint is 1.05 m from the tip of the shoe, what is the shoe tip’s angular velocity? (b) The shoe is in contact with the initially stationary 0.500 kg football for 20.0 ms. What average force is exerted on the football to give it a velocity of 20.0 m/s? (c) Find the maximum range of the football, neglecting air resistance. Consider an amusement park ride in which participants are rotated about a vertical axis in a cylinder with vertical walls. Once the angular velocity reaches its full value, the floor drops away and friction between the walls and the riders prevents them from sliding down. Construct a problem in which you calculate the necessary angular velocity that assures the riders will not slide down the wall. Include a free body diagram of a single rider. Among the variables to consider are the radius of the cylinder and the coefficients of friction between the riders’ clothing and the wall. 6.1 Rotation Angle and Angular Velocity by OpenStax is licensed under a Creative Commons Attribution 4.0 International License, except where otherwise noted.